This is the first in a series for youngsters about the weather. The first thing kids think of related to wind is a kite and the fun they can have. In soft water colors, the reader sees a typical middle class neighborhood on a beautiful day. A little girl, along with her dog and mom, set out on a windy, sunny day for the park. We see her tie on the string and the tail as she begins to fly the kite. The trees show a stiff wind in the park. 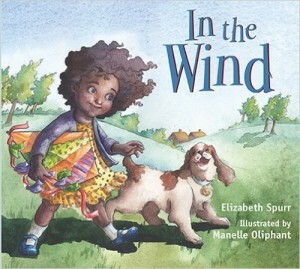 The kite swoops and loops until it catches in a tree, which horrifies the girl. She gets the kite loose, but the kite breaks free and the wind dies unexpectedly. The girl is obviously disappointed. The girl finds the kite again near home, and, with her mother’s help, she gets it down. But the wind will be back some day. Oliphant’s illustrations help the story along at every turn. Kindergartners and first graders can practice their literacy skills through independent reading. This is also a fun read aloud for even younger kids.